This Reference thermometer is ideal for comparison checking the calibration and accuracy of other thermometers and probes, when used in conjunction with a stable temperature source. The instruments measure temperature over the range of -199.99 to 199.99 °C with a resolution of 0.01 °C and an accuracy of ±0.05 °C. The units feature a simple on/off push button with open circuit ‘Err’ and low battery indication, when applicable. The Reference thermometer is supplied with a permanently attached, high accuracy probe incorporating a 1/10th DIN PT100 sensor. The probe measures Ø3.3 x 130 mm and is supplied with a one meter PVC lead. 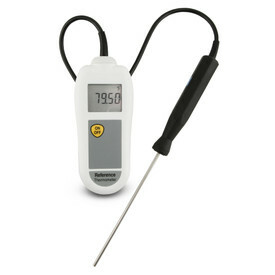 650.012A Rubber boot with probe holder for 650.012 Reference thermometer.